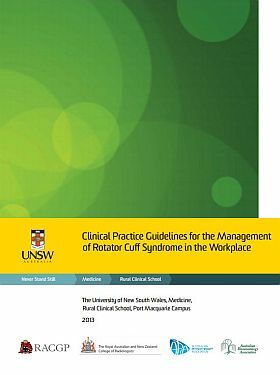 In 2013, Port Macquarie Campus researchers led by A/Prof Sandy McColl produced guidelines for the management of rotator cuff syndrome in the workplace. The work was supported by a grant from Integral Energy. In developed countries, managing rotator cuff syndrome in the workplace presents significant challenges for health care providers and industry employers. Rotator cuff syndrome can substantially affect a person’s health and functioning with pain and/or weakness arising from the injury often restricting a person’s ability to carry out their daily activities and to work. Rotator cuff syndrome frequently results in lost productivity and significant financial costs for industry and employers. It is therefore imperative that appropriate evidence-based management of rotator cuff syndrome is adopted to enhance functioning and minimise negative outcomes for affected individuals, their families and the workplace. The guidelines have been developed using a rigorous methodology for searching, appraising and grading evidence. Recommendations have been developed using research evidence in conjunction with a multidisciplinary working party. Flowcharts and resources have been developed to support the use of the guidelines. Resources include: assessment and review flowcharts, rotator cuff syndrome information sheet (for injured workers) and return to work (RTW) guides for employers and GPs. 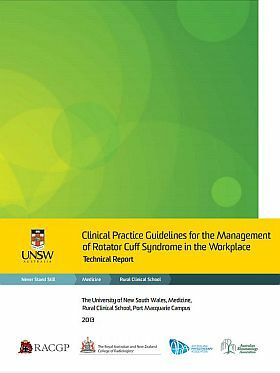 The guidelines are applicable to GPs, medical specialists and other health care providers involved in the treatment of people with rotator cuff syndrome, including physiotherapists, occupational therapists, psychologists, ergonomists, chiropractors and osteopaths. The guidelines can also be used by the injured worker and workplace-based employees involved in coordinating and supporting the RTW for injured workers with rotator cuff syndrome.